I don’t know about you, but by the time I say “no, mas!” at a dim sum feast, it’s usually too late—by that point, I am already stuffed like siu mai. And by the end of the multi-course meal, I’m crawling out of the dim sum house, regretting, just a little, my soy-stained sins. 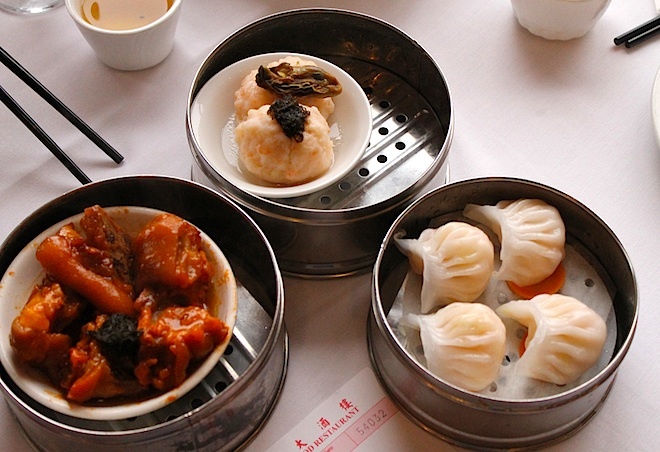 However, at Chinatown’s Dim Sum Crawl this Thursday, April 18 at 6:30 p.m., prepare to be crawling as soon as you meet up at the Empress Pavilion because there’ll be other dim sum destinations to hit. First, the Empress Pavilion, one of the most venerated dim sum palaces in all of Los Angeles, teams up with Anaheim’s Noble Ale Works and dish out: haam sui gau (fried glutinous rice dumpling with pork) and baked char siu bao (BBQ pork bun) with Pistol Whip’d Pilsner as well as shrimp cheong fun (shrimp rice rolls) and sticky rice with the ESB. Then, Mandarin Chateau pairs with Eagle Rock Brewery to serve: xiao long bao (little dragon dumplings) and potstickers with Revolution XPA as well as the house chicken special washed down with the Populist IPA. Next, chef Lupe Liang’s Hop Woo BBQ joins Kinetic Brewing Company and brings together non-traditional crispy fried rice and chicken crunch and Ignition pale ale. Also on the menu is a daring chili frog paired with White Thai, a witbier flavored with lemongrass and kefir lime leaf. Finally, the Chinatown classic Plum Tree Inn gets with Craftsman Brewing Company to offer: a praise worthy Peking Duck paired with Ursa Minor Ale, “dry-beef” with Heavenly Hefe, an ice cream with “French Toast” (a beer float). Forget crawling, someone get me a Rascal scooter. That, I can handle. Tickets must be purchased in advance, be we got the hook-up: Input “LAMag” into the promotional code space to receive a $10 discount.